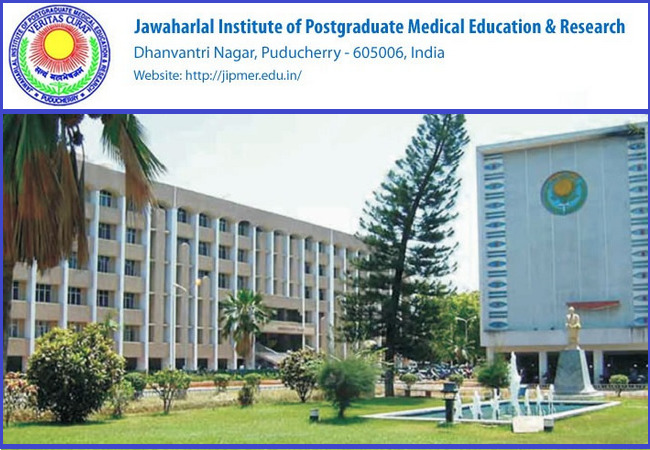 Jawaharlal Institute of Post Graduate Medical Education and Research (JIPMER), Puducherry invited applications for the post of Professor and Assistant Professor. The eligible candidates can apply to the post through the prescribed format on or before 31 August 2018. Educational Qualification: Postgraduate qualification, i.e. M.D. in concerned medical discipline. Experience - Minimum 14 years for Professor and 03 years for Assistant Professor. Application Fee: A Demand Draft in favour of the Director, JIPMER, Puducherry payable at State Bank of India, JIPMER Branch, Puducherry - 605006. How to Apply: Application in the prescribed format. Completed application may submit their application along with all the necessary documents with clear superscription on the envelope that the Application is for the post of ___. The Last Date for receipt of filled in application will be on or before 31/08/2018 (Friday) till 04.30 PM.